The Center for Puerto Rican Studies (Centro) invites you to the opening reception for Las Tres Hermanas: Art, Education, & Activism exhibit at the Centro Library and Archives in El Barrio. 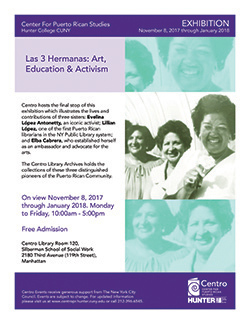 Centro is proud to host the third stop of this exhibition illustrating the lives and contributions of three sisters: Evelina Lopez Antonetty, an iconic activist and champion for social causes; Lillian Lopez, one of the first Puerto Rican librarians in the New York Public Library system and its first Puerto Rican Administrator; and Elba Cabrera, an ambassador and advocate for the arts. Centro’s exhibit will highlight the life and achievements of Hunter College alumna, Lillian López, a pioneer librarian in the New York Public Library system. As an administrator, she helped set policies and changed the way libraries related to minority communities.